Work spaces are being reconfigured to foster idea processing and delivery, as well as a company’s culture and mission. The highly competitive global economy has pushed companies in a broad range of industries  from law firms to game developers  to re-evaluate every aspect of their business. The drive to reduce overhead while stimulating innovation and speed to market has led to many of the shifts happening in today’s office: reapportioning space so less square footage is assigned to individuals and more to collaboration areas; providing a diverse array of locales that can support mobile work styles and team connectivity; and aggressive integration of technology to expedite project execution. These and many other spatial modifications have been successfully embraced and adopted by many different industries. Small, entrepreneurial companies are realizing success with this model, as their size allows them the agility needed for quick maneuvers. The workspace for Methodologie  a Seattle design studio  has several areas for team space and collaboration. Larger organizations may face increased bureaucracy or resistance when trying to implement such wholesale changes. But they understand that future success requires the exploration of innovative thinking about how the workspace can help create a competitive advantage and contribute to the bottom line. There was a significant shift in the manufacturing industry when Toyota introduced its lean-manufacturing method, which focuses on efficiency in the production process. Since then, lean practices have been adopted by numerous industrial leaders such as Boeing and Honeywell. The success realized by these companies has led to other industries applying the philosophy to their business  specifically using the workplace to help with idea processing and delivery. Just as the layout of the factory floor needed to shift to adapt to the lean process, now the design and apportioning of office space needs to be reexamined and redesigned. The lean process in an office environment requires flexible spaces with tools that support workers in their evolving thought process, allowing employees to easily transition to meet the shifting demands of customers. Workplaces are starting to embrace office design concepts such as universal floor plans that use ideal proportions and locations of built spaces, or designating walls as writing surfaces to support ad-hoc collaboration sessions. Additionally, the agile project management method is also gaining more traction across industries. This model relies heavily on the iterative process to expedite the delivery of a product or service. Project rooms  space dedicated to the cross-disciplined project development team  are becoming the new anchor of office environments. These rooms are earmarked for project teams for the duration of a project or a critical push in the process. 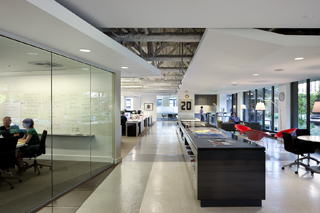 Team members can gather to collaborate or work individually in these spaces. The history of the product development and the story behind any course corrections that were made can remain visibly displayed on the walls along with other reference materials and tools. An effective way to build enthusiasm for the departure from individual offices to collaborative work spaces is to implement small test areas for employees to experience prior to rollout out on a wider scale. During this testing phase, simple spatial enhancements, such as options for vertical writing surfaces, alternative acoustical treatments, lighting options, or new technology and tools, can be evaluated. Designating one area in the office where new products or methods are continuously tested can build enthusiasm while refining the space and elements until it’s ready for wide-spread implementation. Many of today’s product manufacturers are often willing to loan organizations test pilot pieces for experimentation, which further supports this as an affordable and manageable option. The success of these trials tends to quickly travel through inter-office communication channels, triggering early and rapid adaptation with limited effort required from management. Conversely, there is a range of organizational issues that can be addressed, such as supporting the dispersed and mobile workforce. Companies are looking to maintain the strength of their culture among this dispersed workforce, so experimenting with the settings for mobile workers is essential in finding the best solution. Often the approach is to ensure there is connectivity with their stationary team members by providing space layouts that allow for a range of team sizes and communication styles that enable connectivity. Looking to the future, communications will become a more integral part of changes in the workplace. Two-way dialogue about structural shifts historically may have been viewed as complicating or slowing the integration of new ideas or environments; however, employers are moving toward using communication to dispel preconceived notions and create excitement and enthusiasm for potential change. Through a strategic change-management process, a workplace redesign will take into account employee needs and expectations, in addition to the needs of the organization as a whole. Not only does communication and planning need to take place in order to give employees a say in their workspace, but the new space needs to be an innovative setting that richly fosters the organization’s culture and mission. For example, in workplaces that are designed to incorporate a new workflow process  such as lean  opening up conversation about how employees approach the process is a smart idea. In today’s highly competitive markets, there is a need for commitment to evolution in workplace spaces. These new environments require ongoing assessment and response to optimize the office to meet business needs while successfully engaging the employee base to embrace the change. Andrea Vanecko is a principal with SkB Architects specializing in workplace design.